Fear of losing our hair isn’t about vanity. Our relationship with our locks has been ongoing since childhood, and seeing fallen strands piling up after we brush, comb or shampoo is never easy. Losing some hair is natural, but when there isn’t as much growing in as there is falling out, that can cause thinning and bald patches. Often thought strictly to be a man’s burden, nearly 40% of hair loss suffers are women. The most common type of women’s hair loss, androgenetic alopecia, is general thinning throughout the scalp, while men’s hair loss, androgenic alopecia, is most often at the crown of the scalp and a receding hairline. 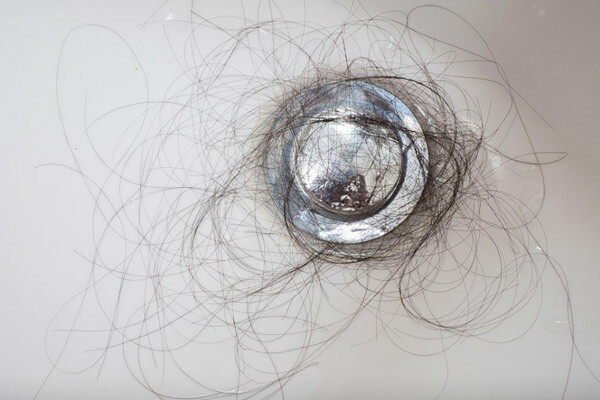 Since there are certain medical conditions and well as medications that can cause hair loss, check with your doctor if you suspect it could be due to a medical side effect. But what’s there to be done if these are not your circumstances? Well, eating a healthy and well-balanced diet with plenty of essential vitamins and nutrients, along with drinking a lot of water, is great for your hair and body, inside and out! Another culprit of hair loss is stress, so making life changes to reduce your stress will benefit you in more ways than one. We also can’t avoid the fact that some hair loss is directly related to genetics. But there are still ways to help improve thinning hair, like taking good care of your scalp. Our scalp is filled with pores, and when they get clogged, our hair follicles are affected, inhibiting new hair growth. Over washing hair, which can cause dry scalp, and under washing, which can cause clogged hair follicles. Not using conditioner, which moisturizes the scalp. Not protecting our scalps from the sun, which can cause UV damage. Scalp Stimulating Shampoo – unclogs pores and protects from cuticle damage which helps hair grow fuller and thicker. Volumizing Keratin Conditioner – adds body without weighing hair down and protects it from breakage. The Regrowth Treatment – contains minoxidil to help reinvigorate hair follicles. The Lift and Repair Treatment Spray – adds lift from the roots, strengthens hair and protects your precious scalp. If you’re affected by hair loss, remember, you are not alone. However, with some modifications to your normal routine, you could see positive changes before you know it! Try the Keranique Hair Regrowth System today!